Here’s how to make salted smoked almonds or other nuts. You can customize this recipe by adding different spices and seasonings after smoking the nuts. 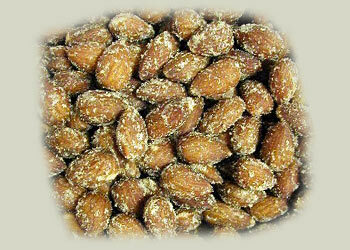 Smoked nuts make a great treat and are a smoked food favorite that can be done in any food smoker. Place the water pan in your food or meat smoker to deflect the heat but do NOT use water. Heat smoker to 300 degrees F and start the SmokePistol™ wood cartridge smoking. In a mixing bowl, combine melted butter or oil with almonds and mix thoroughly to coat. Pour the nuts onto a disposable 12" round foil pan, spreading into a single layer. Place the pan on the top grill or the smoker and smoke nuts for about 20 – 30 minutes stirring several times to ensure even smoking. After the nuts are smoked, sprinkle smoked nuts with salt or other seasoning. Cajun smoked nuts can be made by sprinkling smoked nuts with Cajun seasoning or a mixture of cayenne pepper, salt, pepper and onion powder.